A few years back, before pay-as-you-go SMS sending services like Twilio existed, I needed to send SMS’s to a number of my subscribers, but couldn’t afford the monthly cost, and up-front fees that bulk SMS providers charged. I decided to set up my own SMS sending service using 2G modems plugged in to serial ports of a PC, and driven using AT commands to send and receive SMS’s. I then ran in to the very real problem of “how do I decide which modem to send an SMS on?” Service providers charge different rates to send to different mobile networks, and at any given instant, a GSM modem could be down because of hardware or software failure. This is how I designed a reliable service on top of unreliable hardware, and complex least cost routing rules. For an SMS that I needed to send I wanted to use the cheapest option. However, if a particular mobile network or modem to that network was down, I didn’t want to wait indefinitely to send an SMS. If an SMS had been waiting to send for a while then I wanted to send the SMS, almost regardless of the cost. I’ve always been a fan of swarm intelligence, and in particular ant colony optimisation techniques. Ant colonies are incredibly robust societies, able to survive in the face of natural challenges, without requiring centralised control. Each ant (or agent) follows a number of simple rules, and interacts with ants in its immediate vicinity, and with the environment. A classic example is division of labour in the hive. Each ant is a member of a caste, typically worker ants and warrior ants. Worker ants are smaller in size and perform duties such as brood feeding and hive cleaning. Warrior ants are larger in size and protect the hive from intruders. 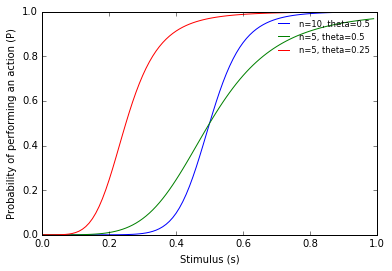 Each caste responds to stimulus proportionally based on the mount of stimulus it receives, as well as its propensity to reacting to that stimulation. For example, when a warrior ant comes across a hungry grub (baby ant) it tends to leave it alone; and when a worker ant comes across a hungry grub it tends to feed it. However, when there is a large number of hungry grubs the warrior ants join in to help with the feeding. This behavior can be modeled with a Sigmoid curve. where is the steepness of the curve, with larger making the curve steeper. Below we have two curves, the blue one for ‘worker’ ants, and the green curve for ‘warrior’ ants. 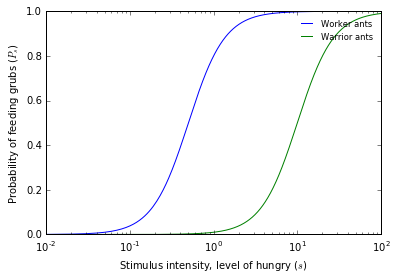 The x-axis is the stimulus, the level of how hungry the grubs are, and the y-axis is the probability that a given worker or warrior ant will get involved with feeding the grubs. As the stimulus (the number of hungry grubs) increases, the proportion of the ants responding to the stimulus (feeding the grubs) goes up. The worker ants respond sooner to the stimulus than the warrior ants, but if the worker ants cannot keep up with demand and the stimulus continues to increase then warrior ants begin to help with feeding. Back to sending SMS messages. These two goals oppose each other. We could send an SMS via any mobile network, to any destination mobile network, but networks often charge more to send an SMS to a competing network. Therefore cost would be higher. We could send an SMS only on the cheapest route, but if that route is down then the SMS would be stuck until that route came back up, potentially leading to a long delay. We need to find a balance that we are happy with. In our system, we have one queue where all messages are added. We also have a number of SMS modems (or routers) that send the SMS’s. Starting at the head of the queue, each router inspects the messages in the queue and decides whether it will send that message or not. If it does, then it removes the message from the queue and sends it. If it decides not to send the message then it leaves it on the queue and moves on to the next message in the queue. Note that this is not a strict FIFO queue. A modem could decide not to send the first four messages in the queue but send the fifth. After it sends the fifth it will then start from the front of the queue again and repeat the process. If it reaches the end of the queue it will restart at the front. Based on the source and destination mobile networks, free SMS’s bundled in to the contract, and time of day a router can calculate the cost to send an SMS. 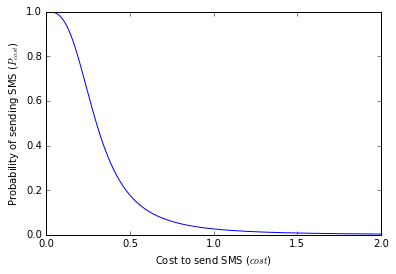 As the cost of an SMS goes up we want the probability of sending it to go down. When it costs nothing to send an SMS then there is 100% chance of the SMS being sent. And as the cost goes up that chance goes down. By the time the cost is 30c there is a 50% chance of it being sent, and by the time the cost is R 1.74 there is about a 1 in 200 chance of the SMS being sent. Cost isn’t the only factor in deciding to send the message. We need to take in to account time in the queue, and the length of the queue. 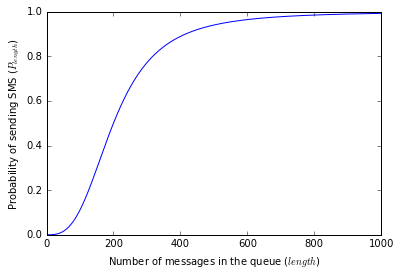 If a message has been in the queue for a long time then we want to have a higher probability of it being sent. Time is the number of seconds that the message has been waiting to be sent. After 20 seconds in the queue the message has a 50% probability of being sent, and then more slowly aproches 100%. 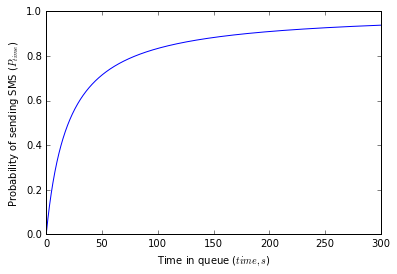 Queue length is a leading indicator to the time time that a message will wait in the queue. In a long queue, messages at the back of the queue will take longer to be sent than if the queue was short. We want a higher probability of sending messages when the queue is backed up than if the queue is short. Using this routing method allowed us to send SMS’s in bulk across a number of mobile networks that had complex costing schemes (fixed number of free, bundled SMS’s to any network, unlimited free SMS’s only on home network, and costing that varied by on- and off-peak times), and was robust to hardware failures of mobile routers. This technique can be used whereever there is a need to divide work among multiple consumers, and there is a complex decision matrix on whether a consumer should perform that work or not. While the solution is not guaranteed to be the global optimum, it will more often than not be a good solution over a wide range of changes in the underlying system, making it more robust than hard-coded rules.